China is turning to foreign robotics and smart factory technologies to enhance competitiveness as it seeks to close the gap with Japan and Germany by 2035 under Premier Li Keqiang’s “Made in China” strategy. Faced with rising labor costs owing to its shrinking labor force, China has already overtaken Japan as the world’s largest industrial robot market. 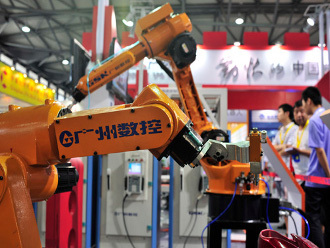 Industrial robot sales in China this year are estimated to reach USD4.2 billion, according to the Chinese Institute of Electronics. But a lack of core technology means the nation has been highly dependent on foreign supply. Imports from well established overseas major producers such as Swedish-Swiss firm ABB, Germany’s Kuka, and Japan’s Fanuc and Yaskawa Electric, account for more than 60% of all robots bought by Chinese manufacturers. For specialized six-axis robots, which provide greater flexibility and applications than earlier generations, overseas manufacturers have a 90% market share in China, according to a Huatai Securities research report. In a move that signals the growing importance of the Chinese market, Siemens said that its Chinese subsidiary will lead the company’s global effort in research in autonomous robotics. “The decision is based on two factors,” Siemens’ Chief Technology Officer (CTO) Roland Busch told reporters at a marketing event in Suzhou. “First, China is Siemens’ second largest overseas market after the U.S., and second, China has outstanding talent.” Siemens said its robot research center will begin operating later this year at Tsinghua University in Beijing. The company does not make robots itself, but supplies hardware and software that controls them. The Chinese robot market is forecast to grow at an average annual rate of 23.4% in the four years to 2019, much faster than global shipment growth of 13%, according to the International Federation of Robotics. This means 39% of new supply could go to China in 2019, up from 27% in 2015. The need to upgrade and automate factory facilities is driven both by rising production costs and changing consumer demand. The share of tasks performed by robots is projected to rise to 25% across all manufacturing industries globally by 2025, from 10% in 2015, according to the Boston Consulting Group. It will slash average manufacturing labor costs by 18% to 25% in China, Germany, the U.S. and Japan, the report said. Robotics and digitization are part of strategies outlined in the “Made in China 2025” plan unveiled by Premier Li Keqiang in 2015. Other technologies highlighted in the plan include 3D printing, big data analytics, bio-engineering, new energy and new materials. Li aims to transform China into a “strong” manufacturing nation in a decade, and match the strengths of Germany and Japan as leading innovators in certain industries in two decades, the South China Morning Post reports.